CfJJ regularly publishes reports on important juvenile justice issues affecting Massachusetts. Featuring relevant state data, national research on best practices, and stories from impacted young people and their families, these reports provide critical information to the public and policy decision-makers about the best ways to improve our state systems for children and young people. Seizing An Early Opportunity analyzes the findings of a survey of 95 police departments in Massachusetts regarding their formal and informal diversion practices. While diversion offers police departments an opportunity to reduce the negative impacts of justice system involvement on young people, practices are applied inconsistently and unequally across the state. This report examines examples of successful diversion programs and makes recommendations for improvement at the local and state level. Shutting Down the Trauma to Prison Pipeline analyses the recent trends related to the increasing number of child welfare cases in Massachusetts, particularly involving Latinx youth. The report also examines at the impact of unaddressed trauma on young people's behavior and the need for more accessible, culturally competent behavioral and mental health care. Visioning an Improved Youth Justice System analyses community-generated recommendations on alternatives to young people's arrest and court involvement. The white paper outlines seven themes emerging from focus groups in Boston and a framework for a pre-arraingment diversion blueprint. Less Crime for Less Money examines the current state of Massachusetts' pre-arraignment diversion options, the best practices as identified by the best available evidence, and our recommendations to enhance public safety, improve youth outcomes all while saving taxpayers dollars. 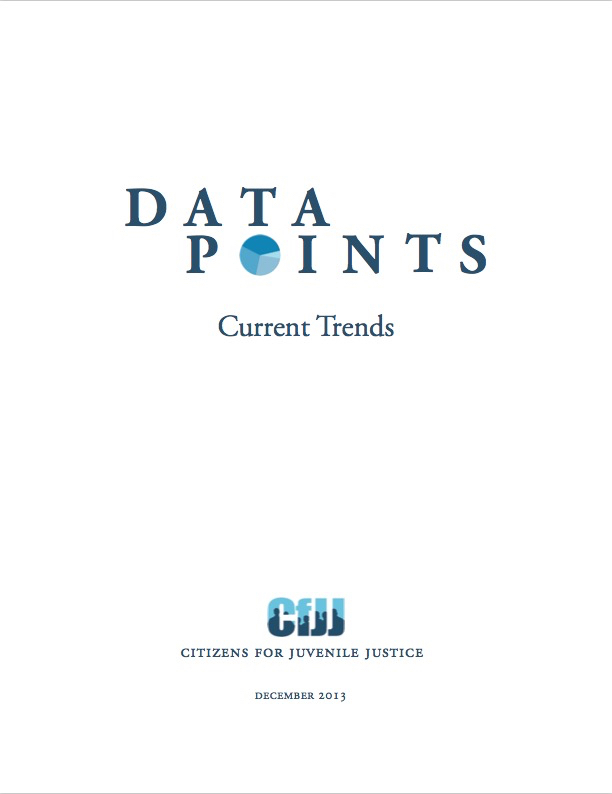 CfJJ continues its Data∙Points series with the latest release, Current Trends, which highlights multi-year downward trends at several key points in the Massachusetts juvenile justice system: arrest, court processing, pre-trial detention, and post-adjudication commitment to the Department of Youth Services (DYS). This report also provides an overview of the age, race and ethnicity, and gender of youth in our system, offering a glimpse of the thousands of teens who travel through our juvenile court system each year. Data∙Points: Who does the Massachusetts juvenile justice system serve? The 2012 Data∙Points publication, Who does the Massachusetts juvenile justice system serve?, provides a snapshot of the youth who come into contact with this system. The Data∙Points series compiles the most current data from the juvenile justice in Massachusetts to support an informed dialogue among policymakers and the public about the state of our juvenile justice system - who it serves, where it is functioning best, and where it needs to improve. Arrested Futures, a report by Citizens for Juvenile Justice in partnership with the American Civil Liberties Union, examines school-based arrests at Massachusetts’ three largest school districts – Boston, Springfield and Worcester – and evaluates which students are being arrested and why. Report authors reviewed years of arrest data from these districts, including both numerical data and written reports from arresting officers, to determine the number, rate, and nature of the behavior that lead to the arrests. These findings are an important addition to existing research examining the “school-to-prison pipeline,” showing that students are being frequently arrested for minor, disruptive behavior that could be better addressed by school administrators. CfJJ's December 2011 publication, Data∙Points, compiles the most current data from police, courts, probation, and the Department of Youth Services (DYS) to paint a broad picture of how Massachusetts is serving some of its most vulnerable children and youth: those who are involved in our juvenile justice system. CfJJ hopes the report is the first step in starting an informed dialogue about how best to improve our system, so that it is both fair and effective. Minor Trangressions, Major Consequences examines Massachusetts' policy of sending all 17-year-olds accused of a crime to the adult criminal justice system, a practice that makes kids more likely to reoffend and threatens their safety.The report points to numerous national studies that find youth sent to the adult system are more likely to reoffend and to escalate to more serious crimes than those in the juvenile system. Research also shows that minors held in adult facilities are at high risk of committing suicide and of being physically or sexually assaulted. In the report, Massachusetts teens recount being strip searched in adult facilities and learning to look up to adults imprisoned for serious crimes, including murder.